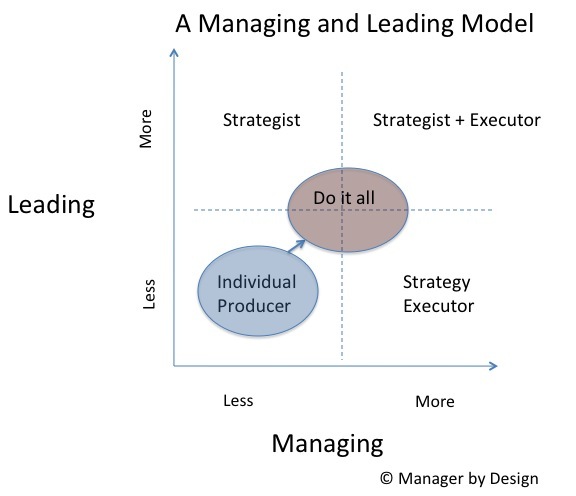 In this model, I make the point that it is possible to be a leader without being a manager, and a manager without being a leader. The main differentiation is the action of setting strategy and the action of executing the strategy. At the same time, we normally conflate leadership with doing both strategy and execution. 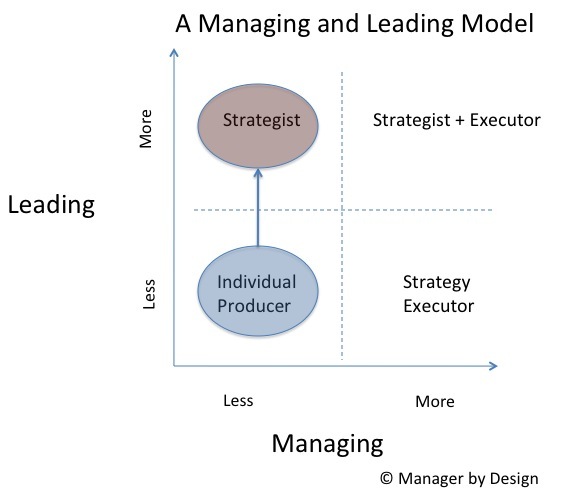 In my model, that is fine, but the leadership element is still tied to strategy and the management element is still tied to execution. If you want people in your organization to be both strategists and executors of strategy, then this model is useful. So let’s look at how that can be. 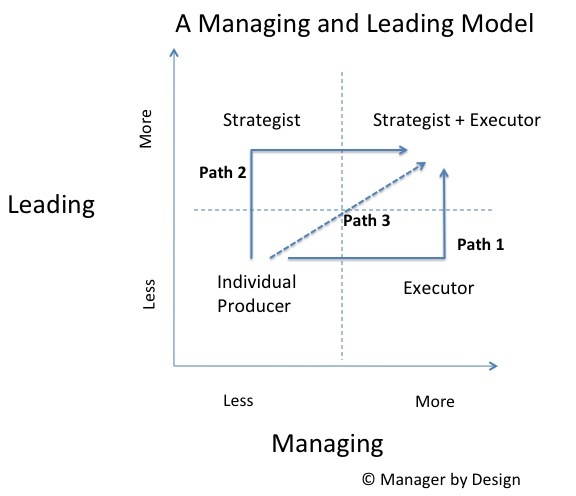 Here are the three paths that are typically considered how someone becomes a do-it-all leader/manager (or, in my model, a strategist + executor). In this path, someone becomes a manager of a team they probably served on. They are charged with keeping an existing strategy going, and making sure that team has the existing level of productivity. At a certain point, that manager steps out of that role and starts coming up with new strategies and direction for the organization, while continuing to be a manager of a team or organization. In my previous articles, I showed why managers are often resistant to change or are bad at leadership – by design. In today’s article, I’d like to walk through another common scenario – the leader who then has to manage. I’ve created a model that shows the difference between leadership and management. In this model, it allows for an individual person without a team to demonstrate leadership. If they are involved with setting the strategy for an organization, they are a leader. Oftentimes this is the person with the idea, and that person does a lot of work to spread the idea, get support for the idea, and convince other parts of leadership and individual producers of the need to pursue the idea. If that idea actually gets executed, it sure looks like that person is a leader – the person leads by being out in front of an idea, and leads by making sure the idea got into the hands of those who can do something about it. So that shows how someone can become a leader without managing a team! I love this scenario, because it shows that someone in an individual contributor role can be considered a serious leader in an organization. There are many people like that in an organization, and this kind of path to be a “strategist” shows career growth that can provide terrific value to the organization. It also shows that the strategist does not have to be the strategy executor (a.k.a., manager) to be a leader in an organization. We’ve seen this frequently in organizations. When someone shows leadership, they are given a team to execute that strategy. It is a common marker of success for that individual. Here’s your team – now go do it! Even though this is a common path for people to become managers, there is a design flaw for those organizations that change their strategy. The managers are focused on and understand a single strategy, and, in this visualization, aren’t involved in, or aware of possible other strategies that follow. I call this the “do it all” scenario. It kind of makes sense, as you can see that when someone gets promoted from an individual producer role to a manager role, they are then required to show leadership, which involves developing strategy skills as well as people management skills. 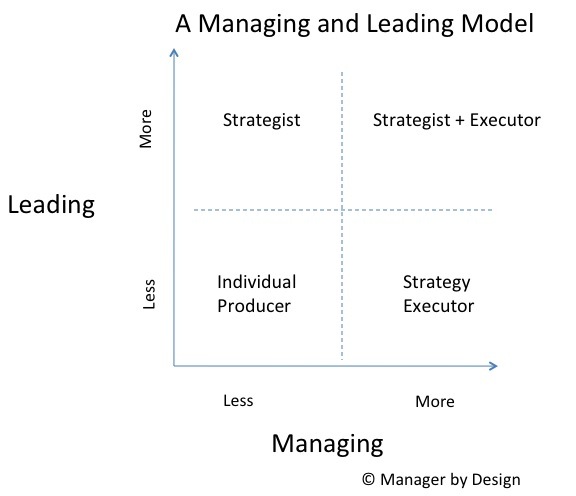 In this model, the manager that I typically think of when writing about managers is in the lower right corner – a manager who is a “Strategy Executor.” The organization that the manager works for has a strategy, and the manager makes sure that this strategy is executed. This manager typically has a team of people in some capacity (either direct reports, virtual, outsourced vendor) to make sure the strategy is executed. As an example, if you are a Training Manager, then the strategy is that the organization is using “Training” as a means to help the organization run better. “Training” is the Strategy, and the Training Manager is needed to execute that strategy. So the training manager has to make sure the training is executed. That means there needs to be budget, a team of people and facilities to get this done somehow. That’s the manager’s job – use these resources to execute the “Training” Strategy. 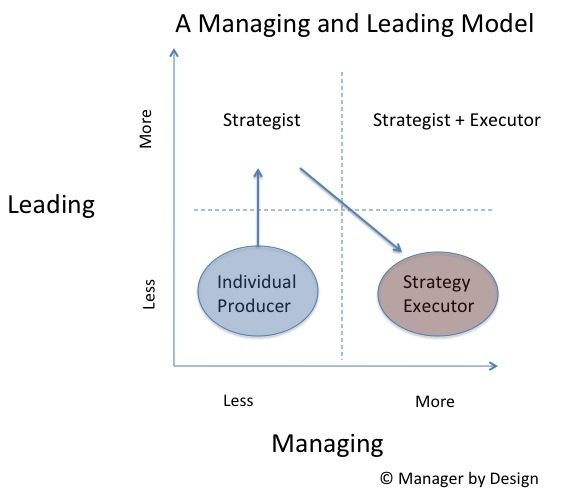 But how does one become a strategy executor, a.k.a., manager? There are various paths. This seems to fit in the popular conception of how people become managers, but under this model, you can see a potential design flaw. The person becomes a manager without having been involved with the strategy development. In the case of the Training Manager, the strategy executor will be executing the “Training Strategy” without really knowing what went into the development of that strategy.